Castle Connolly America’s Top Doctors 2017 | Dr. Eric R Mandel, MD is the only exclusive laser vision correction surgeon to have been selected as one of America's Top Doctor's by Castle Connolly for 16 consecutive years. Castle Connolly America’s Top Doctors 2017 has once again honored Dr. Mandel with this distinction. Dr. Mandel is the only exclusive laser vision correction surgeon, in the New York Metro area, to have been selected as one of America’s Top Doctors by Castle Connolly, for 16 consecutive years. As Castle Connolly will tell you, Top Doctors make a difference. Here at Mandel Vision, we pride ourselves in giving our patients the best possible experience. This begins with the friendly faces of our front desk staff and continues throughout your experience with us. We feel this is one of the many reasons that Dr. Mandel is consistently chosen for this special accolade. 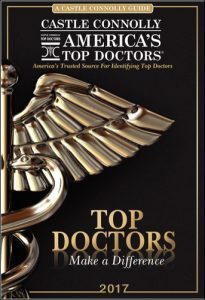 The Castle Connolly America’s Top Doctors physician-led research team carefully reviews the credentials of every physician being considered for inclusion in Castle Connolly Guides®, magazine articles and website. The review includes, among other factors, scrutiny of medical education, training, board certifications, hospital appointments, administrative posts, professional achievements and malpractice and disciplinary history. Click here to read more about Castle Connolly’s America’s Top Doctors distinction and nomination process.